Assesses public health risks: Contaminated beaches pose public health risks and can negatively impact Rhode Island’s valuable tourism industry if not properly monitored and managed. Managers use beach monitoring data to ensure that licensed beaches are safe to swim in, develop preemptive beach closure protocols to protect public health, and continuously evaluate and upgrade current monitoring and notification methods. Identifies pollution sources: To fully eliminate the public health risk of contaminated beaches, the source of pollution must be identified and remedied. Beach monitoring data can be used to find and eliminate sources of contamination at saltwater beaches. For example, the City of East Providence and the RI department of Health used this data to identify sources of pollution, develop an action plan, and leverage grant funding to evaluate the possibility of re-opening Sabin Point Park Beach. Napatree Point in Watch Hill, Rhode Island. Photo courtesy of the Coastal Institute at URI. Rhode Island has over 400 miles of coastline, to which residents are guaranteed access in the state constitution. Rhode Islanders and visitors alike enjoy recreational opportunities that depend on clean beaches. 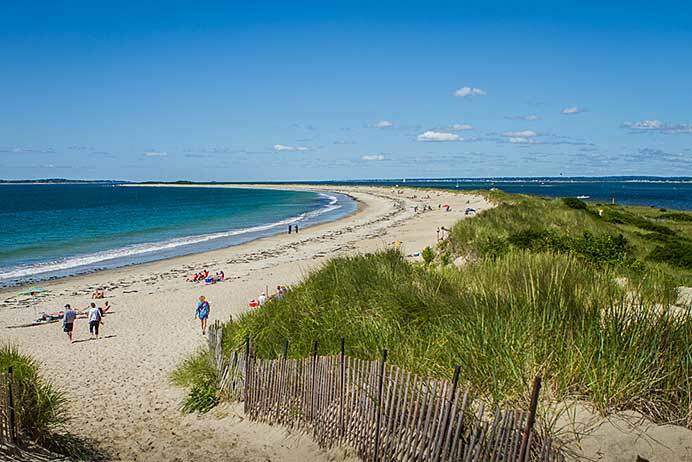 In 2002, 64 percent of Rhode Island households visited beaches in the past year and 70 percent of those households said they had a “need” for beaches, making going to the beach and swimming in saltwater the most popular water-based activities in the state. In total, there are over 20 million beach visits—defined as one person visiting a beach for any part of a day—in Rhode Island each year. Saltwater beaches are a keystone of the state’s tourism industry. Rhode Island’s leisure and hospitality sector includes over 57,000 jobs, which is over 10% of the state’s non-military labor force. To protect this economic interest, it is critical that the state monitors the waters off these beaches regularly to know they are clean and safe, avoiding health risks for millions of visitors. Protecting beachgoers and improving saltwater quality requires several actions: 1) monitor the saltwater beaches for potential contamination; 2) close the beach and notify beachgoers if there is an unsafe level of pathogens present; and 3) reduce numbers of pathogens entering the bay from land-based sources to prevent future beach closures and health risks. High pathogen levels also lead to shellfishing restrictions, as bacteria could also pass from shellfish to humans during consumption. Contamination by pathogens that flow from the land is the primary threat to human health at Narragansett Bay and South County saltwater beaches. The pathogens are washed into the bay with stormwater runoff, often after being discharged from wastewater treatment facilities and septic systems. These pathogens, often measured with representative species or groups, can cause gastroenteritis, which is characterized by inflammation of the stomach and the intestines that can lead to symptoms like vomiting, headaches, and fever. Other pathogenic affects include ear, eye, nose, throat, and skin infections. Pollution from stormwater runoff can be a particular problem for our beaches, especially in urban areas. This is due to large concentrations of impervious surfaces, such as roads, parking lots, and buildings. These hardened surfaces prevent rainwater from soaking into the soil, which serves as a natural filter to pathogens and other contaminants. 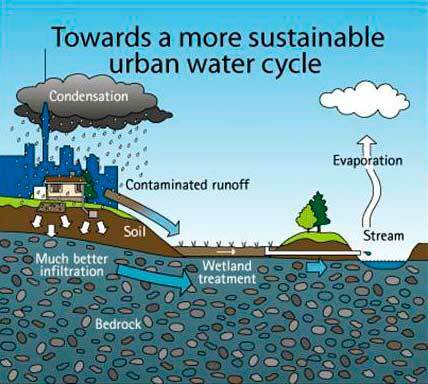 Instead, rainwater flows along the top of these surfaces ­picking up pathogens, oil, salt, and other substances along their way until the now-contaminated rainwater flows directly into the bay or is funneled to a storm sewer.Alternatively, porous surfaces, such as natural areas, gravel, and certain special paving materials, allow rainwater to seep into the ground, which provides natural filtration, reducing the amount of contamination before the rainwater makes its way to swimming areas. When large volumes of water flow into storm sewers that are combined with sanitary sewers, wastewater plants can be overloaded, causing untreated wastewater to make its way to receiving waters such as Narragansett Bay or its tributaries. Much of this problem in Rhode Island has been resolved by major upgrades at the state’s largest wastewater treatment facility, Field’s Point, but other wastewater plants remain impacted by stormwater. Control of non-point sources of pathogens, which are difficult to identify and remediate, will also be key to resolving pathogen contamination at several of Rhode Island’s coastal beaches. Image courtesy of Clemson University. The large amount of impervious surface in the upper Narragansett Bay, and around the greater Providence metropolitan area has led to unsafe levels of pathogens in the bay and along the beaches, which is why fewer beaches are licensed for swimming as you travel north in the bay and there are currently no beaches open to swimming in Providence. But recent improvements have resulted in a reduction of pathogens in urban areas, and several currently unlicensed urban beaches—Sabin Point, Bold Point, Field’s Point, and Rose Larissa—are being monitored to determine if they could be licensed in the future.